As the owner of the computer you are responsible for keeping your computer tuned up. If not, it will make it much more difficult to troubleshoot when an issue arises. For example, you may think you have a problem with your computer hardware, when in fact it could just be a matter of poor PC maintenance. Here are a few things that you should be doing on a regular basis to keep your computer running in top shape. (add a reminder in your Outlook or Google calendar). Your browser stores a lot of information as you are surfing the web. Browsing history, temporary internet files, cache files, saved passwords (don’t do this here is why) and lots more. 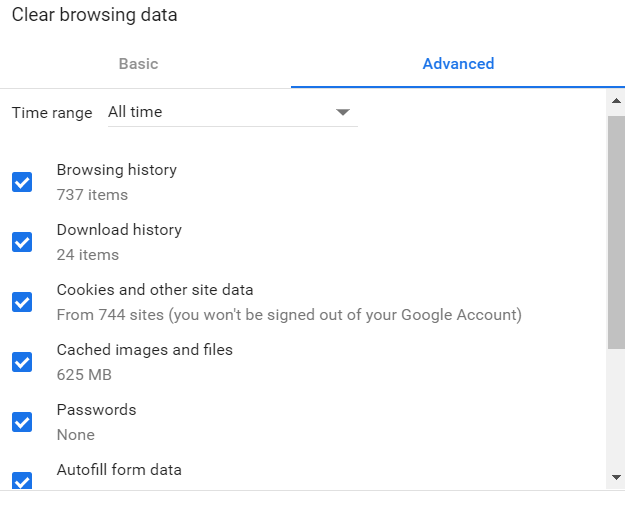 Most of this should be purged on a regular basis to keep your browser clean and fast. Each browser has different settings to accomplish this, but the objective is the same. Choose what you want to clear or clear it all, that’s what we do. Also see why you should be using Chrome in Incognito Mode! Make your choices as you see appropriate. Note above that you also have a Settings button. This allows you to specify how much of your hard drive space is used for temp files. This determines how much hard drive space you would like to allocate for temp files. Unless you are a heavy graphics user or gamer you can set this to 300mb or less. If you find that it is not enough you can always set it higher. 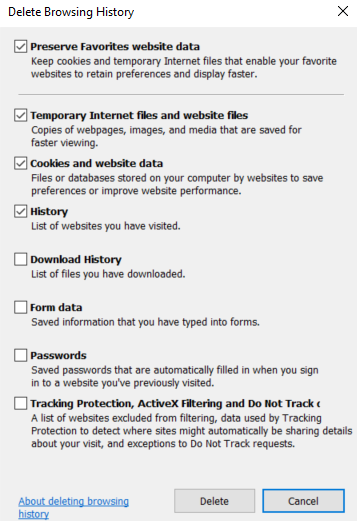 ​You will have several choices here, generally you want to click all of them to purge all cookies and temp files. 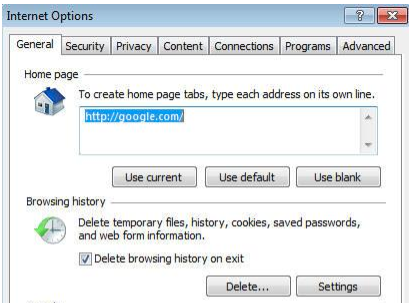 ​What it does: Every time you visit a website your browser stores the location of that URL temporarily in a “cookie”. This is sort of like saving it in memory. Have you noticed that once you visit a site, and then click on the BACK button how fast that page pops right up? You did not have to wait for it to download all over again because a copy was retained in browser history. Well, after a while you accumulate sometimes thousands of these temp files and it is a good idea to purge regularly. Something else that is stored is Form Data, usernames and passwords etc. How Often: Once a week for active Internet users. Once every 2 weeks for intermediate users. Once every month for occasional users. See same instructions above. ​The last thing you want to do is let your processor get too hot. The picture here is the cooling fan that sits on top of the processor in your computer. Just below that is the aluminum ‘heat sinc’ that dissipates the heat away from the processor, sort of like the radiator in your car. ​It’s sole job is to keep your processor cool at all times. You DO NOT want your processor fan to look like the picture here!! Look at all the dust built up on the top of the fan and clogging the thin slots of heat sinc beneath it. 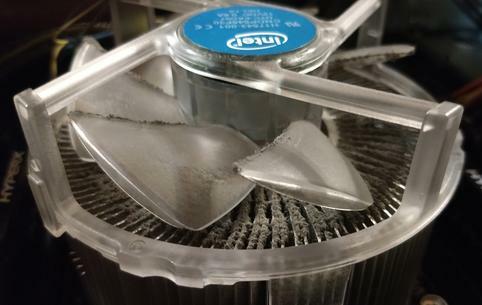 There is no way air is going to move efficiently enough to cool this processor. The result: Random system shut downs or reboots. Why? Because the Intel processor has a built in safety net so to speak where if it get too hot, it will shut the computer down to avoid damaging the processor. How to Avoid That: Simple. Shut the computer down, open the cover, get a can of compressed air and blow out the dust. If there is a lot of dust you don’t want that blowing around in your office, so you can take it outside to do this. This involves unplugging all cables from your computer in the back temporarily, but it is a much more thorough way to do it. How Often: One a month at least you should blow our your system. What it does: When using your computer data become fragmented, or scattered on all over the hard drive. Defrag organizes and consolidates the data on the drive so it is stored more inefficiently allowing your system to run much cleaner and faster. How Often: At least once every few weeks. From the Desktop, RIGHT click on Computer (WIn7), This PC (Win 10) or My Computer (WinXP) and RIGHT Click on the drive letter (if you have more than one hard drive…do one at a time). Choose Properties/Tools …and click Defragment Now. Follow the prompts, note that it may take a while so go make yourself a sandwich. Need a Solid Computer System? What is does: When you delete something on your computer it is not actually removed from your computer until the Recycle Bin is emptied!. It accumulates and takes up valuable hard drive space. How Often: At least every 2 weeks. ​On your desktop you will see the Recycle Bin. Right click on it and choose Empty Recycle Bin. ​Tech Tip! : You can set the properties of your recycle bin see screenshot below (Win7). Also note that the Recylcle Bin is shared by ALL drives. 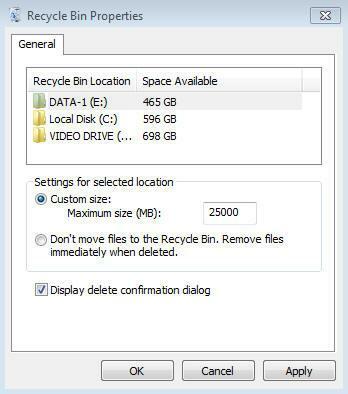 You can allocate how much is used by each drive, OR you can choose to not use Recylcle Bin at all so when you delete something it really is GONE as soon as you hit delete. Warning here though sometimes the Recylcle Bin comes in handy if you delete something by mistake allowing you to bring it BACK from the dead.Just double left click on the Recycle Bin and it will show you all the things that you have deleted. To UN delete it, RIGHT click on the item and choose RESTORE. It will put it back in the original location form where it was deleted. ​What it does: Antivirus / antispyware programs are absolutely useless unless the definitions that are used by the program, are kept up to date. The definitions are the database of acknowledged viruses and there are new ones every day. Fortunately, the newer anti virus programs update automatically anytime you are connected to the Internet. If you have an older anti virus program that has not been updated for a while, you are NOT PROTECTED. Do something about it today.Microsoft Security Essentials is FREE, it protects and updates automatically. Take inventory of what program you have currently installed. If you have none, stop right here. Get an anti virus program installed ASAP. If you have every been infected by a virus you would know that it is not a fun position to be in and ALL of your data is at risk. Once you have the antivirus program installed that is really all there is to it. You just have to keep it updated. If you pay for an annual subscription to Nortonas, AVG, McAfee etc. Although this is automatic when you first install it you should spot check this regularly. Which Program to use: This is a popular question but a personal choice. If you stay with the well known names like Microsoft, Norton’s, AVG etc you can never go wrong. Also there may be different versions of each one for example, antivirus only, or a full internet security suite (antivirus and firewall). They will make my computer slow. This is not true. It is not the antivirus program that slows down your computer it is thefirewall software that does it. If you have high speed internet you have a hardware firewall built into your router. That said you do not need a software firewall (internet security suite mentioned above) on top of that. This is where people go wrong. They have too much firewall protection and they fight each other, this is what slows down your internet NOT the antivirus portion of the program. Also, Windows has a firewall built in as well. If that is also turned on you would have 3 firewalls on at the same time, hence the problem. Bottom line: Get an antivirus program ONLY not one with the internet firewall included like Nortons 360 etc. If you already have N360 you can turn OFF the firewall portion of you choose and leave the antivirus only. To Pay or Not to Pay, that is the question: If you are a fan of Norton’s, you will pay yearly for updates but a very reliable program and worth every penny of the $39 or whatever a year for that security. Or you can download and install Microsoft Security Essentials. It includes antivirus and spyware protection, automatic updates and by the way…its FREE. A beautiful thing. Also see Personal Online Security for more safety tips. We are not a fan of automatic Windows updates. The problem is that with the auto setting turned on, Microsoft attempts to update drivers and install many optional updates that are not needed for security necessarily. The video drivers are what usually causes issues primarily but you may get other unwanted updates as well. For example, in early 2017 Microsoft released an update that automatically upgrade thousands of users from Windows 7 to Windows 10…while they were sleeping! They went to bed with Windows 7 and woke up with Windows 10. This of course created an uproar by customers worldwide. When you check for Windows updates manually, Microsoft scans your computer and looks for critical security updates to the operating system. These are the important ones will will keep Windows secured and help avoid system crashes, viruses vulnerabilities, or incompatibility issues. Below that you will see OPTIONAL updates. You can decide if you want any of these but be careful. Updating drivers on video cards for example can cause you to lose displays. WIth automatic updates turned on you are opting to let Microsoft decide and usually installs ALL of them. Again, we like to have control over what gets installed on our computers. How Often: Manually, once a month at least or when any severe threats are announced or in the news. Contrary to what you may have heard it is VERY important to shut down your computer regularly. Why? When using your computer, with every key stroke you are generating another form of unnecessary temporary files, called TMP and CHK files among others. The ONLY time these files are purged out of your system automatically, is DURING the Shut Down process. If you never shut down this process does not take place and your computer becomes a storage unit for thousands of temp files which slow your system down. Another reason for shutting down is pure logic. Think about the wear and tear on your machine. Would you leave your car running for days or weeks at a time without shutting it down? Probably not. Get into the habit of shutting your computer down every few days before you know it it will be your new routine. It has the chance to purge temporary files and it will make your system last much longer! How Often: At least once a week. During the weekend is a good time. How: If you do not know how to shut your computer down properly, you are in trouble. Give us a call now! ​In Windows you have a utility called the Task Scheduler which can come in handy for scheduling routine maintenance on a regular basis. Click on Start/Programs/Accessories/System Tools/Task scheduler. It will automate most of the processes mentioned above based on a schedule that you set. Give it a try, it is very easy to do. ​If you have any questions about routine maintenance gives us a call we will be happy to talk to you about it. Our number is at the top of this page. Also see the NTI Tech Knowledge page for many helpful articles on tech issues and troubleshooting.